Northeast Corner of Oak Street and Scottsdale Road. To see more of Nancy’s work click here! Welding has opened the door to my creativity and my artistic soul. 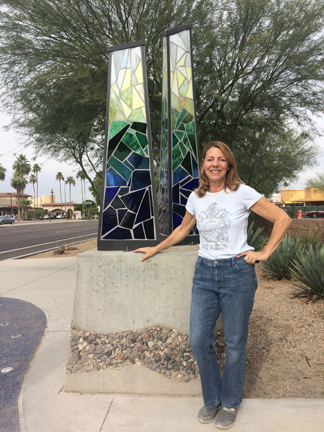 When I am working with steel, I feel I can create and build just about anything – from a pair of bookends to a mosaic glass and steel garden sculpture. New ideas are constantly flowing in my head, for new ways to cut and bend steel, more complicated designs, ways to add light, color and new finishes. Figuring out how to make something is both a challenge and a joy. Living in Arizona, I am inspired by the color, pattern and design of the desert. Studying and observing my surroundings keeps me thinking up new patterns, designs and shapes for sculptures and other steel structures.